I managed to get 3 challenges into this one. This is for Mojo 179. 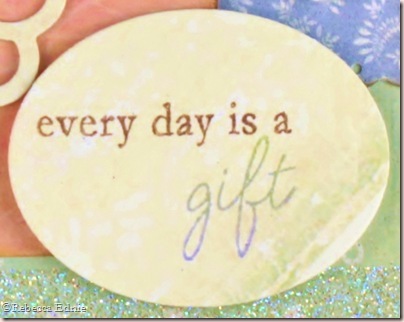 And Papertrey Ink’s Make it Monday challenge 3 : Glitter Strips with Scor-Tape. And JustRite Stampers 49: Direct to Rubber. This one is the hardest for you to see. I used two colours with the Rock n Roll technique for the sentiment but it is really hard to photograph. I don’t have a macro lens for my DSLR and so I can only get so close and my crop in isn’t so hot, shame because it looks so pretty IRL. I used green for the base colour and rolled the bottom edge only in purple. So to help you see it, I edited the photo with WAY too much saturation, it looks silly but you can see it at least! I love colouring jugs like this in silver like galvanized steel. I always add a bit of rust using E08. I start with a base colour of cool grey then add the ‘rust’. Then I continue colouring the jug so the brown blends in to look like just like rusty spots. The purple on the tulips is intended to NOT blend in. I was colouring them like these. Don’t you just love them? 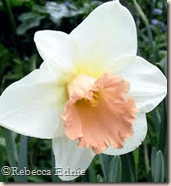 I am really in to pink centered daffodils so I coloured them like the one here. Previous postSwinging from the Chandeliers?? For the OCC and Mojo. 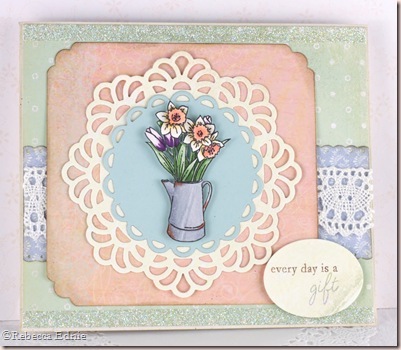 Gorgeous card, Rebecca — great job with JustRite's challenge! Thanks for playing! Lovely card, Rebecca! Your flowers are just beautiful!